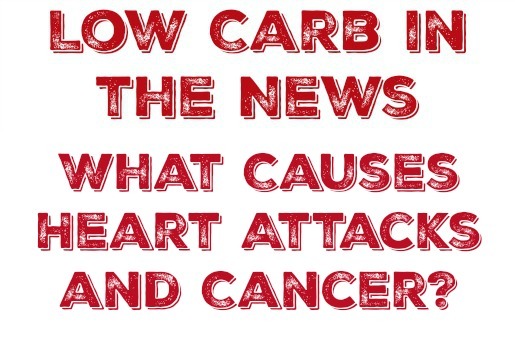 This Week in Low Carb News: What Causes Heart Attacks and Cancer? What causes a heart attack? – I thought the most interesting aspect of this article was the discussion of rapid weight loss as a risk factor in heart attacks. Our fat acts as a reservoir of toxins that can be released into the body when we lose fat. Remember that the best weight loss is gradual and the result of lifestyle change, not from radical surgeries or starvation. Alcohol increases risk of cancer – Whoa. Absolutely fascinating article on the links between alcohol and cancer. I would definitely suggest you read this. People aren’t born with a taste for fat, they learn it. – Dumb article predicated on the idea that fat is bad. Humans don’t have to learn to enjoy fat, we have to have it drilled into our heads that fat is bad until we start avoiding it with terrible consequences. New Diabetes Canada Dietary Guidelines allow for low carb option – The long slow crawl to LCHF continues. Not too fast though because if they just said LCHF fixes everything, then people would wonder why they were told to avoid fat for all those decades and start suing on behalf of all those dead relatives. Vegetarian Protein is just as complete as meat based protein – Uggh! Another terrible brick in the wall of vegan propaganda using terrible science and dietary silliness. Put down your whey and pea protein and eat a steak the way nature intended. Chimps Eat Baby Monkey Brains First – Disturbing image I know but it backs up the hypothesis that the thing that made us Homo Sapiens is meat consumption, especially organ and brain meat. What is in wholewheat bread? – Turns out mostly soya flour. Link between NSAIDS and Heart Attacks – Is there anything that won’t kill us? Oh yeah, meat. Plastic in Take Out – Read this and you will want to cook at home a lot more. The Germs that Love Diet Soda – Pretty uncomfortable reading this while drinking my Coke Zero. Killing for Profit – Love Dr Fung. He’s not pulling any punches. Interview with Dr Aseem Maholtra – Relevant part starts at 8 minutes and continues on for about 30 minutes. The UK is instituting a sugar tax and Dr Malholtra fields questions from the public. Pretty interesting. PREVIOUS POST Previous post: What is Sugar Free and Keto Friendly at Panera Bread?